Mission Del Rey, hand woven southwestern rugs and Zapotec rugs by the world famous Zapotec Indians are southwest rugs with outstanding designs for western ranch, cabin, lodge, log home or any rustic room with patterns like Native American rugs. Southwestern rugs 20"x40", western area rugs 32"x64" and southwestern runner rugs 30"x96" with traditional Navajo Indian rug patterns woven by hand using beautiful high quality wool. 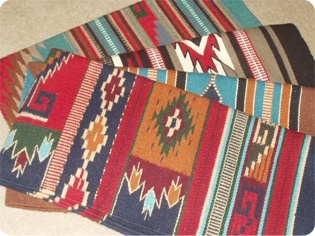 Southwestern rugs or tapestries look great on your floors or walls. Saddle blanket rugs and runner patterns with western designs of red, blue and green create a beautiful color pallet you will love. Customer Comments: The floor runners were of wonderful quality and were accurately represented... The selection and variety of southwest rugs is the best, largest,and most varied as any I've seen. Shipping and delivery were fast and came sooner than expected. I would strongly suggest this merchant. -Dianne, VT. The southwestern handwoven rugs that you find here at Mission Del Rey are made using some of the finest materials that can be sourced from anywhere. While many of the artisans today use modern-day materials to make their rugs, the use of generations-old techniques for some of the ingredients – like natural dyes – is what adds a distinctive touch to these handmade pieces of art. High quality wool and the use of natural dyes in many of these rugs is what sets these creations apart from the traditional rugs and carpets that are available almost everywhere else. Unlike the harsh chemicals used by mass-producing weaving machines in factories abroad, the materials used to produce our rugs are often locally sourced. Use them as area rugs, as focal pieces over wooden or tiled floors, to dress up your walls with tapestries and hangings, to compliment your existing southwestern-style draperies and furnishing. You could use them to bring volume and texture to an otherwise plain-looking space, or as fabulous additions to your bathroom, kitchen, bedroom, dining area, a child’s playroom or a den. Regardless of what your intensions are for using one of our Southwestern rugs, we are confident that you’ll find exactly what you are looking for right here. For classic southwestern rugs or a tapestry rug, choose black and red with grey and white accents. For a traditional southwest feel add turquoise, dark blue or green. If you have a special floor space or need just the right wall hanging our wool weavings are tapestry quality. Pick out one of our wool rugs. American Indian style rugs with classic Native American designs and handwoven wool Indian pictorial rugs add life and color as well as offer unique insights into Native American history. Not only are southwestern rugs admired for their great beauty, but the skill and hard work needed in making Native rugs and runners is also greatly appreciated in the same way as mission rugs or craftsman style rugs. The makers of hand woven wool rugs are highly skilled and begin the rug making process by kneeling in front of a vertical wooden-framed loom. The designs are then put into place by using a shuttle to weave different colored yarn together, making large-scale geometric characters and designs. In the beginning, Navajo rugs as well as those of some other Southwest Indian tribes were made of hand-spun cotton thread. However, once the wool of domestic sheep was introduced to the region by the Spanish settlers, the people primarily used wool to make their colorful southwestern rugs and other traditional weaving. Today, many of the modern southwestern rugs are made in areas where Spanish and Native American histories come together to create colorful designs. Southwest rugs, with their warm earth tone colors and traditional southwestern designs make them excellent for rustic home decorating. You will find everything from Zapotec rugs with no two alike, to southwest table runners and western tapestries. Designers love hand woven rugs because of the rich colors and textures. You too will enjoy the warmth and color created by decorating with southwestern rugs. The art of weaving Native American rugs is very prominent in North America. Native Americans create the most desirable and expensive rugs that money can buy, but sadly, the shrinking industry is only hanging by a thread due to modern mass production and the art being lost with this generation. The best known type of textile art available in North America is Native American rugs and blankets. The level of craftsmanship and attention to detail are impeccable making these rugs extremely pricey. In the southwestern United States, as well as in Mexico, these rugs are still made in the traditional way. The artisans kneel in front of a loom made of wood, and they weave colored threads using a shuttle. They proudly produce impressive and large scale geometric designs. Shifting to wool when domestic sheep were introduced by the Spanish, the original Native made rugs were made of hand spun cotton thread. One of the many impressive Native American rugs that can be found is the Navajo designs. Another interesting method used for making these rugs is through finger weaving. Immaculate finger weaving is done by many tribes which was a key method used since ancient times. One of these is the tribal rug of the Tlingit people known as Chilkat. Another is the Seminole sash. Another essential area of the textile art of Native Americans is patchwork. Although they have their own methods of making textiles, quilting which was taken from Europeans was given a new kind of energy with their skilled craftsmanship. Star quilts are also one of the crafts they are well known for. Many other designs also still exist but in modern times, mass production as well as a more modern life style has greatly impacted this exquisite tradition. It's sad to realize that there are fewer Native American rug artists than ever. Some are doing all they can to keep their artwork and hand crafts alive. There are very few of those resilient weavers that use the old traditions of Native American rugs in today's times. The prices could go up to 6 digits, especially on the vintage rugs because of the long amount of time spent creating them. Only a very little percentage of the younger generations of Native Americans are studying the intricate art of making Native American rugs. It would be a perfectly good investment for those who desire to get an exclusive design that exudes the Native American culture. Though this would not be for general use, but rather, a more ornamental and decorative piece, it would be great if more people come to recognize the ancient and slowly withering tradition of Native American rug making.